What a hugely encouraging first comment. LLLOOOLLLL! What a trip! So we are seeing from the pigeon’s point of view? He flew around and landed a few buildings away and even turned toward home a few times – that was the coop on the roof? Oh, what fun! 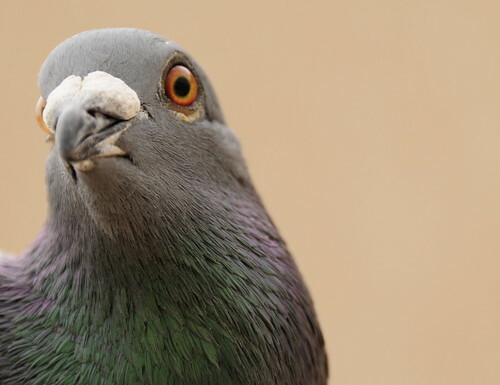 Please, when you can, show us what a pigeon looks like with the equipment on! This is very very cool. 🙂 Yup. Now you can see why I prefer homing pigeons. They’re a little more daring. Indeed that was the coop on the roof. It’s great fun – very different. Fascinating to look at what they see. I will try to get that photo… but it’s not easy! The children liked watching the film for about 10 seconds. I don’t think they can appreciate what’s happening. They were more excited when he looked at (and therfore filmed) other pigeons. Thank you Charcoal. Now I know where Bu Yousef lives! happy navigation! As usual… You get the point of the post and your comment is 200% relevant. That is honestly fantastic! The music is so chill! Gotta love it! Cool pigeons! Keep the tradition going! I [heart] Charcoal. Way to go homie…yo! I’m bored of your useless comments! How do people who know you put up with you? Let your superb detective skills fill the gap. When you said (on one of my posts) ‘you haven’t seen anything yet’ – or something like that about the Mac, I didn’t think much. You see I only buy original software (therefore expensive to buy everything) and I’m not into games etc. I knew this would have been it with the iPhoto wnd iWeb… Then I saw what iMovie can do!!!!!! Oh my GOD. Your words flashed on my screen the day I did this video :). It took an hour to edit! I used it as if I was doing it for years. Wow, so glad I stumbled across this, it’s all kinds of *neat*. It would be nice to get a still photography camera to take pics at certain intervals, with shutter speed high enough to get crisp individual pics (how fast would you need for pigeon flight?). Complicated and unwieldy equipment though, probably. Good luck with your project, and hard luck about your camera. Looking forward to more Avian Adventures! mabrook! 2 new babies in the nursery! “The size of the net allows sparrows and other small birds to come in and out for a snack and a drink.” – cuteness!! Oh, BuYousef, I checked in today so I could show my husband the video of the pigeon view of the flight, and saw the photo of the bird with the camera equipment on, and then – oh horrors! Learned of the disaster. I am SO sorry. I bet it was expensive equipment, too, and oh, what fun it was to see the first flight. Was this Charcoal again? And he just didn’t like it? The camera allows timed photos but as you said, the shutter speed is too slow. I will stick to video for now (when I get another). It’s no fun if it’s easy. It is a shame of course, but it will give me time to redesign the ‘jacket’. It wasn’t charcoal. It was the pigeon in the picture with the camera attached. This photo was taken 10 minutes before the camera disappeared in the sand of Mangaf.. or on someone’s head? I hope AdventureMan enjoyed the first video. We were dying laughing at the video, a pigeon’s view of the world. We watched it several times, actually, and saw new things every time. But then we stopped laughing when we saw that the equipment had been lost and you were worried about whether the pigeon would even come back. We were dying laughing trying to imagine you, getting the camera on, holding the pigeon in one hand and trying to get far enough away with the camera in the other to get a good shot, as the pigeon struggled to get free! 🙂 wow that was so good. the video coverage the footage too! 🙂 lovely birds-view! stumbled upon it only after reading intlxpatr making a mention of it. what an adventure indeed! a pity the camera had to be lost, and was wondering if it was a light weight one, didnt weigh down too much? on the bird. Very light weight… I wouldn’t use it otherwise. It’s the size of a chewing gum pack, and weighs half that – at most. Thanks intlxpatr. Fixed… Try it now… nothing new yet though. Thank you so much, BuYousef! While we are going through mass re-locating process from the foothills of Canadian Rocky Mountains to an unknown country Kuwait, your pictures and your passion towards the country and Mangaf has erased some of our concerns to move to the next step of living experience.